Give kids an entire kingdom to explore with this fun, foldable play set by designer dad Luis Albarrán. Once upon a time, there was a cardboard kingdom where knights defended the power of play and friendly dragons guarded hoards of imagination. Dad and designer Luis Albarrán noticed something universal about kids: They love to play with boxes big enough to become medieval manors. So he created this play set to take little lords' and ladies' imaginations to the next level. 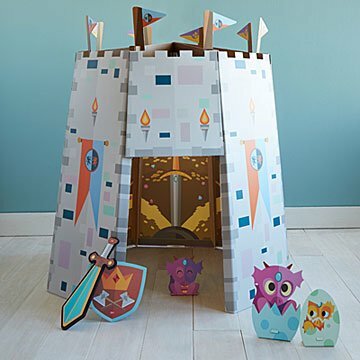 Unfold and assemble the castle in minutes without any special tools or wizardry. Kids will enjoy giving names and special powers to their new dragons and suiting up for heroic quests in pint-sized armor. And the best news of all: Everything is made from 80% recycled (and 100% recyclable) materials to promote storybook sustainability. The playhouse and accessories are water resistant and can be customized with washable markers, but shouldn't be left outdoors in rainy realms. When the battle's complete, the foldable design breaks down in seconds to store in your favorite dungeon. Made in Mexico. Love it! Love it! My grandkids had so much fun!!! !